The Scottish National Gallery houses Scotland's collection of western art dating from the Renaissance to 1900. 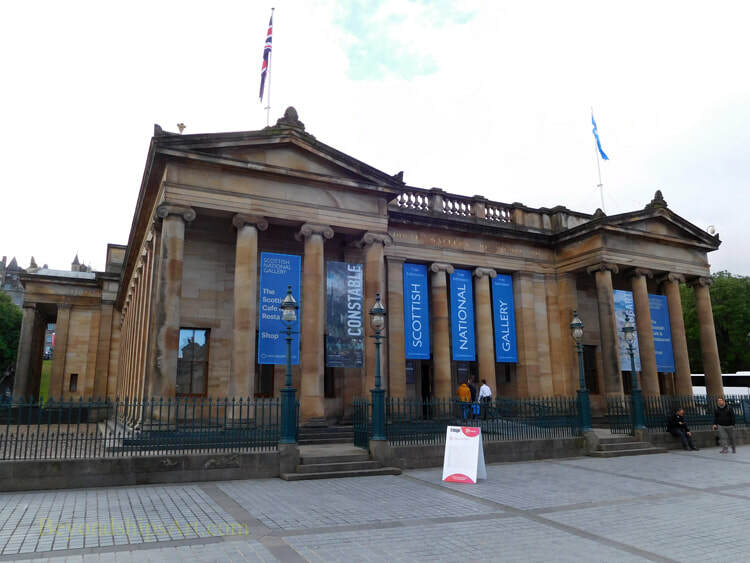 It along with the Scottish National Portrait Gallery and the Scottish National Gallery of Modern Art make up the Scottish National Galleries. It has an outstanding collection of European Old Masters including works by Raphael, Titian, Velazques, El Greco, Reubens, Vermeer, and Rembrandt to name a few. It also has an extensive collection of works by Scottish artists including Raeburn, Wilkey and McTaggart. There is a delightful room full of Impressionist works surrounding John Singer Sargent's portrait of Lady Agnew. Prince Albert laid the foundation stone for the National Gallery of Scotland building in 1850. When completed, half of the building would house the national collection while the other half was for the use of the Royal Scottish Academy of Art and Architecture (“RSA”). By 1906, the national collection had gown to such an extent that legislation was enacted authorizing the National Gallery to take over the entire building. The RSA moved to the neighboring Rpyal Institution building, now known as the Royal Scottish Academy Building. The National Gallery Building was expanded to add more galleries at various points during the 20th century. However, the need for additional space continued. In the early years of the 21st century a major redvelopment project was undertaken. 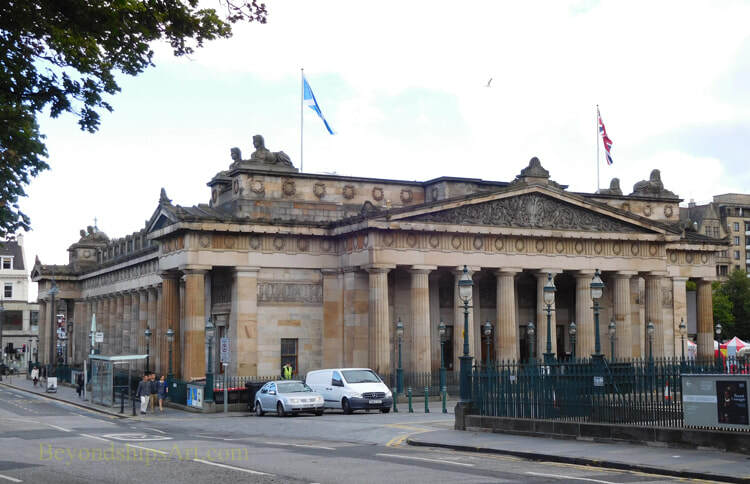 The National Gallery Building was connected to the Royal Scottish Academy Building by an underground link. This passage also contains a lecture theater, an interactive gallery, a shop and a restaurant. Although still sued by the RSA, the Royal Scottish Academy Building was re-configured to provide space for temporary exhibits by the National Gallery. The National Gallery's two neo-classical buildings were designed by William Henry Playfair. They are located on The Mound just off Prince's Street in the heart of Edinburgh. For information on visiting the Scottish National Gallery, see the Scottish National Galleries' website. Above: The National Gallery of Scotland Building. Below: The Royal Scottish Academy Building. Exhibition review: "Rembrandt: Britain's Discovery of the Master"
Exhibition Review: "Constable and McTaggart: A meeting of two Masterpieces"